I was introduced to this dish as a 10-year-old. I hated it then. I hated the beans and cherry tomatoes that went in it. It was only when I entered my 30s that I developed a taste for Thai food and boy, has that been a revelation. 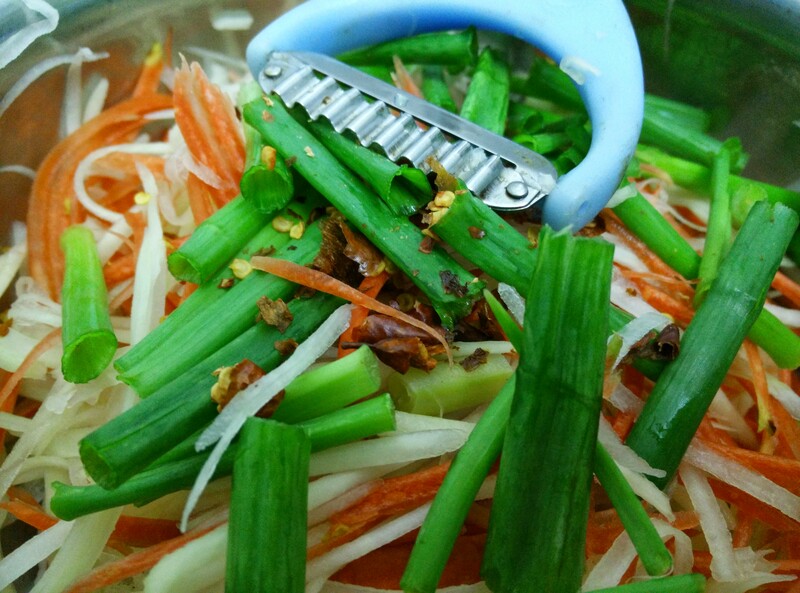 I’ve tried to Thai-lise every dish I can make, mimicking tastes I’ve gathered over my many trips to Thailand. But the Som Tum will always hold a special place in my heart, I learnt to make it the authentic way from a road vendor on Soi 16, who even let me whip up the dish and use her wooden mortar and pestle to make it with her. 🙂 On that trip back home, my bag was full of food stuff–squid ink pasta, sticky rice, wild rice, sauces, salt, chilli and a wooden mortar and pestle. 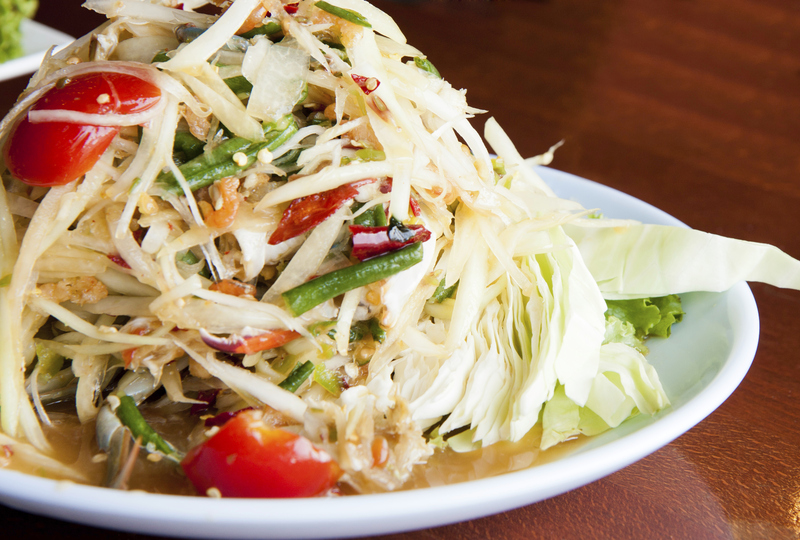 The green papaya salad is a perfect accompaniment with varied kinds of foods. I specially like to team it with grilled chicken or fish or with basil rice that’s served with sweet-sour chicken. 1. 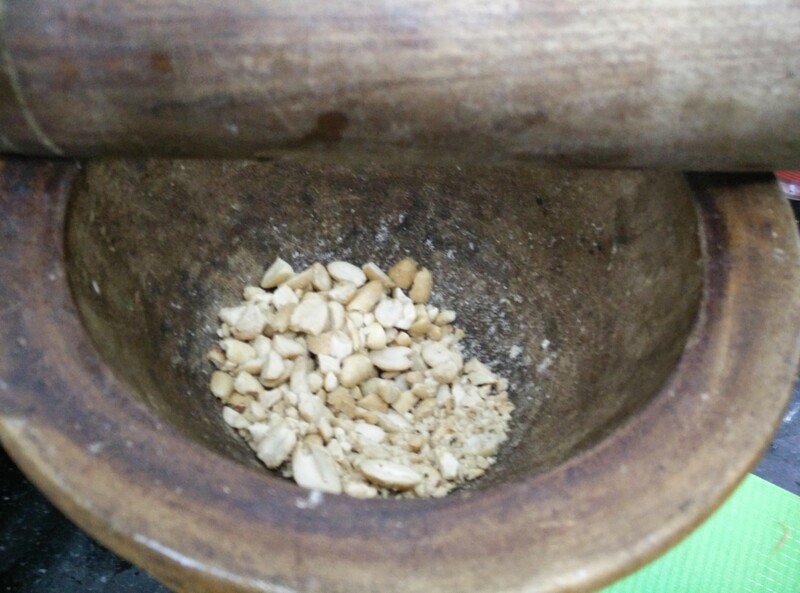 Clean the mortar and pestle well and start the process by grinding the jaggery, chilli and peanuts in it. 2. Add the fish sauce, oil, lemon juice and halved tomatoes and mash it further till all the juices blend in. 3. Now add the beans, carrot and papaya and mix well. 4. Season with salt and lemon juice. 5. Heap up on a flat dish and garnish with fresh basil leaves and sliced red chilli.